Time for some fun with the big #12 brush. I have a folding travel brush by DaVinci that I carry around with me everywhere – for when you need to bust out with a juicy wash. I have to say – there’s a world of difference between the real brush and the brush pen. I forget occasionally how much more complex / expressive the real sables can be. The cartridge fed brush pen I often use is a safety net. You can’t spill the ink, you can’t over or under load the strokes…but you know, it’s just so much better to have the real liquid ink experience. A fully loaded brush just flows so well. And the real sable splays out in all these crazy random ways. When I’m working this way I need a huge stack of paper. I just toss anything that is even slightly off kilter and start again. I might do five attempts in a 5 min pose. 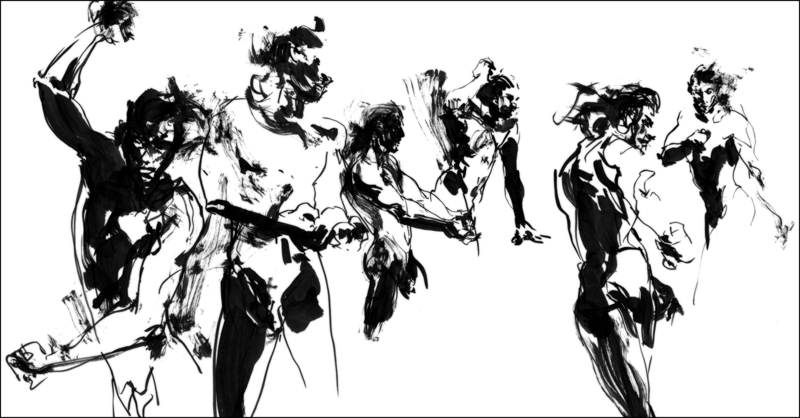 I need that freedom knowing each individual drawing doesn’t matter – you’re looking for that perfect slashing gesture! Mr. Holmes, I´m an ink and brush user myself and .. what can I say? You´ve just shown me another way to look at this tool… actually, I want to swear out loud how much I loved this drawing (and your watercolours), but I´m afraid you might be a gentleman and perhaps I should stick to the nice language. BEAUTIFUL, INSPIRING BOLD ARTWORK. Thanks for sharing.